As a lone forward Sanchez’s role in the away side’s pressing scheme was simply to direct the opposition’s build-up. To do this, Sanchez would press City’s ball carrying centre back in a direction whereby he could prevent circulation back across to where he came from. By keeping City’s play on the same side Arsenal would have a much greater chance of winning the ball through tackles/interceptions or forcing long balls and recovering the ball with their superior height in the defensive line. For Sanchez’s efforts not to be wasted adequate support from the midfielders was key in denying the home side accessible routes to progress their build-up. This was largely done in man-oriented fashion with Ozil and Xhaka sticking tight to their assigned opponents. For much of the opening exchanges this was very effective, with City largely unable to access the midfield the centre backs were frequently forced into long balls. This meant the home side struggled to build stability, with Arsenal able to force frequent turnovers, this made the game into more of an end-to-end contest than Pep would have liked. As mentioned earlier City’s inability to access midfield not only meant they lacked stability but also blunted their attack. With a well executed build-up being central to everything that happens afterwards in Pep’s game model, this was no surprise. The difficulty they experienced in accessing the midfield stemmed from issues at the base of their midfield. In the early stages of the game; Toure and Fernando, the double pivot, were both positioned fairly high as they sought to give the centre backs space to dribble forwards and find routes to progress. However Sanchez’s speed meant it took fairly short periods to create access. This became a problem when combined with the weak spacing between Toure and Fernando which contributed to making Arsenal’s pressing more effective. Toure and Fernando were often positioned on the same line, and were at times acting too close to one another which had a number of negative effects. By operating too close to one another they invited the pressure from Arsenal’s midfielders since they could both press and retain the support from one another. This was due to the short distances that City’s midfield had between themselves, thus they reduced one another’s space and time to receive the ball by attracting pressure. Furthermore they either made low intensity or non-existent attempts to get free from their markers and this static nature played into the hands of the Gunners’ midfield. Recognising the weakness of the current midfield dynamic Pep adapted the structure in midfield. One of the midfielders was now required to come deep and receive from the defenders, the other meanwhile would push onto the next line. This led to City progressing into midfield more regularly by posing more questions to Arsenal’s pressing. The increased staggering in midfield meant Arsenal would have to press in a more unbalanced fashion if they wished to retain individual access, this could of course create other and potentially more dangerous issues. With one of the midfielders acting deep, just above the two centre backs; City had a 3v2 advantage in the first line against Sanchez and Ozil. Although they possessed this overload previously, it was now more useful due to the shorter distance from the centre backs to the deepest midfielder. With the short passing distances the centre backs could use Toure/Fernando to play first time passes across to the other centre back despite being Ozil marking from behind. When the distance was longer, these passes were not viable since the time they would take to travel would give Ozil time to move forward and intercept whilst also allowing Sanchez to adjust his positioning. With these switches they could eventually create space for one centre back to dribble forwards to progress or repeat the process until a suitable progression could be found. Another key to this was City’s strong presence behind Arsenal’s midfield line. 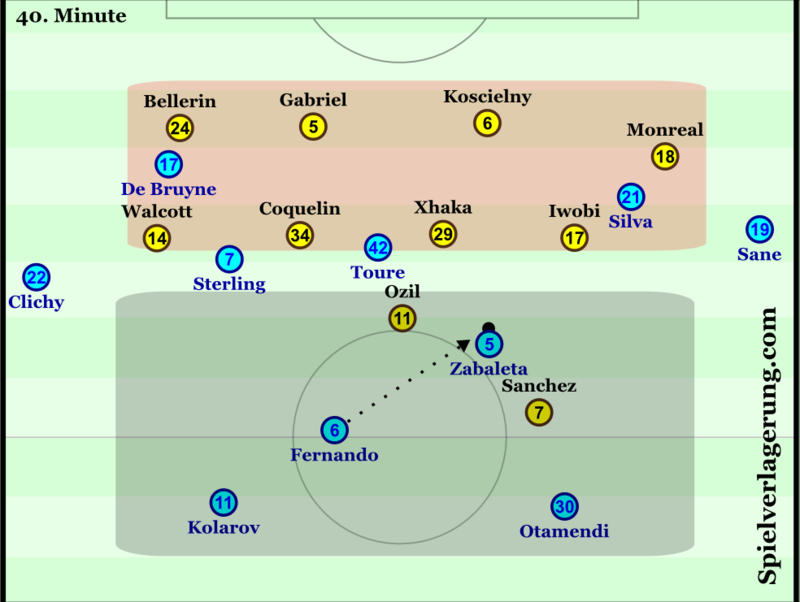 With De Bruyne, Sterling and Silva operating in this space, they were able to influence Arsenal’s midfield four to remain in deep positions to cover. This reduced their capacity to contribute to the pressing attempts further ahead. With City now more frequently executing their build-up effectively Wenger’s men were gradually moved into deeper and deeper positions as City built stability in the game. With the front 2 now less able to prevent City building up Wenger instructed Ozil to move into a deeper position just ahead of the midfield four as he sought to further secure the centre of the pitch. Of course this meant Sanchez operated as a lone forward and thus he was unable to control City’s build-up. The bigger problem however was that, even with his sporadic backwards pressing attempts, Pep’s side were establishing a circulation rhythm in front of Arsenal’s midfield. With little pressure on the ball in front of Arsenal’s midfield, City would be able to force the away side into several long shifts which would eventually lead to openings with the effects of fatigue. For the time being, this tested Arsenal’s mid-block and more specifically its ability to protect the space immediately behind the midfield. In their attempts to do so, Arsenal operated in quite a position-oriented manner with quite strong levels of compactness. This meant City spent large periods circulating towards the flanks unable to create the situations to advance into the ten space. The Etihad outfit thus focused on overloading the areas around the flanks and attempting to break through towards the byline from there. If these initial attempts were not successful they could switch the ball across and isolate their wingers against Arsenal’s full-backs. Arsenal’s deep 4-4-1-1 shape with little pressure on the ball in front. City’s structure was thus adapted again in line with this increasing wing focus. While Clichy was initially operating wide with De Bruyne in the left half space, he would now operate more narrow with De Bruyne alternating with Silva in occupying the left flank. At the start of the 2nd period yet another structural shift was evident from the home side; with Sane moving to the left wing, Sterling moving to the right and De Bruyne moving up front. This was arguably a better use of the attacking personnel with City now having players who thrive in isolation situations on either flank. This also lead to some interesting 4-2-4-0 like structures where Silva and De Bruyne occupied central spaces behind Arsenal’s midfield no players immediately occupying Arsenal’s last line. The results of Arsenal’s inability to control City’s ball circulation was increasingly evident in the 2nd half where the midfield in particular appeared to be fatigued. As such the away side’s compactness greatly reduced in line with the decreasing intensity of their ball-oriented shifting. Guardiola’s side were therefore able to make a number of entries into the box through the half spaces, simply by moving back infield from wide areas. This was effective with the London side unable to adjust their defensive shape quickly enough to cover the diagonal runs from the likes of Sane and De Bruyne. The 2nd aspect behind the home side’s dominance in the 2nd half was their excellent control of defensive transitions. This was achieved through their excellent box cover and intense counterpressing. By retaining a strong presence around the edge of the box during counter attacks the Citizens were able to cover the exit routes for any potential counter attacks. This allowed them to either intercept any passes or swarm the receivers with a ball-oriented approach. This presence was often created through the inverted movements from the ball-far full-back and the deep midfield pair. Another aspect within this transitional defending was the backwards pressing from the City players ahead of the ball. With the players covering the edge of the box, Arsenal’s counters could be controlled and slowed down giving time for the players ahead of the ball to work backwards and assist the counterpressing attempts. This marked a drastic improvement from not only the first half, but an issue they had shown in recent weeks, and combined with their monopoly of possession it gave City complete control of the second half. Victory meant back to back victories for City at a ground they had not won at since September (their own). A dominant second half display was key to their triumph and the most pleasing aspect was their excellent control of defensive transitions, an aspect that had been poor particularly in defeat to the champions. Guardiola will be hoping this victory over fellow title rivals gives his side confidence particularly with a busy festive period and the clash at Klopp’s 2nd placed Reds on New year’s eve on the horizon. By contrast defeat marked back to back defeats for Wenger’s men which raise doubts, yet again, over their ability to challenge for the title. 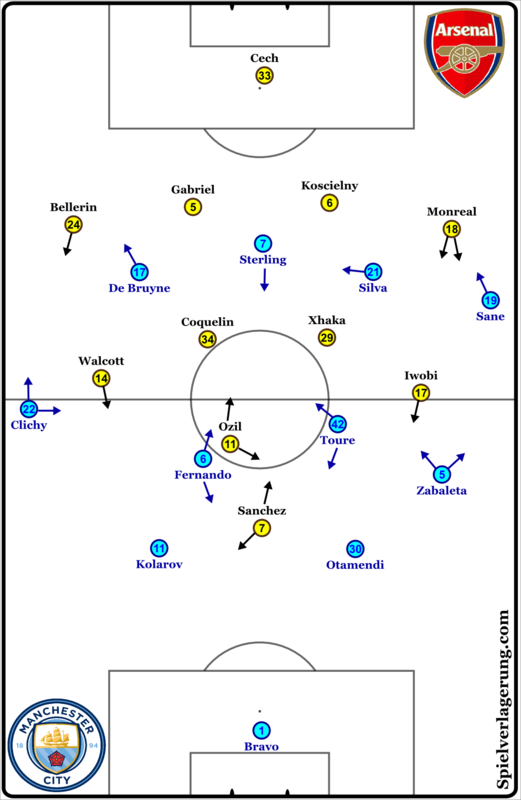 The game followed a rather common pattern in Wenger’s defeats against Guardiola whereby Arsenal’s passivity eventually led to large fatigue and worse defensive cover in turn. With a number of winnable games on the horizon, Wenger and the Arsenal faithful will be hoping the squad show an ability to bounce back from these set backs. Second half they played without a striker. with 2 nr 10’s. Over crowding the midfield. And 2 wingers who make the runs inside. They played like a 4-6-0 in theory. 1_ press By Sanchez on Kolarov while Ozil Covering and on he opposite side, pression from Ozil while alexis is Covering? Yes, theoretically. But the work rate/energy levels were dropping since Arsenal hardly kept the ball and thus had so much pressing to do. Hmm, I understand. I said that based on what I saw from Sporting x Braga (will send you the link via twitter because I don’t know if I can post a link from another site right here) I know the structure and qualities of the teams are different from Arsenal x City, but was interesting what Braga made. Great article. Couldnt watch the game but you described it very well. Thanks for that. I’ve been saying this since 2014- this is the best football analysis site in the world. And JD, you are a legend. Question for you- I noticed, especially in the 2nd half, that Arsenal’s pressing a bit odd. Odd in the sense that while the team looked to sit back and be compact, Sanchez was still harrying defenders all by his own (which was, predictably, ineffective since he had no support and City just passed around it around him.) Do you feel the manager is to blame for this disjointed pressing or is it the players? I’d say the coaching staff have a lot of work to do with regards to Arsenal’s pressing, when I watch Arsenal it often tends to be quite individual which shows weak priming on the training field. In this game I think they became tired very quickly (perhaps apart from Sanchez) and a big part of that was the inability to retain possession meaning they had a lot of pressing to do. Excellent content again JD you keep killing it. Why do you think that Guardiola’s teams aren’t that great in games that are have a transitional pattern to them? Or is it just early days? Thank you, I wouldn’t say they’re not a threat but I think a lot of Pep’s game is built on an effective build-up, it gives them a foundation to attack and good positioning to control transitions. Pep’s spoken on numerous occasions about not enjoying end to end games so it’s certainly not his preferred style.